This perfect big family friendly/dog-friendly home is located in the quiet neighborhood of Agate Bay on the North Shore in the midst of all of the vacation activity spots on the North Shore. Our spacious four bedroom home with two living areas sits on a beautifully landscaped, sunny, fully fenced 1/3 acre lot just a couple of blocks from the dog-friendly Patton Beach at Waterman's Landing. Relax in the huge HOT TUB under the stars on the patio. Warm up after a full day of sightseeing, hiking, or skiing in front of a cozy fire in the big stone fireplace in the family room. 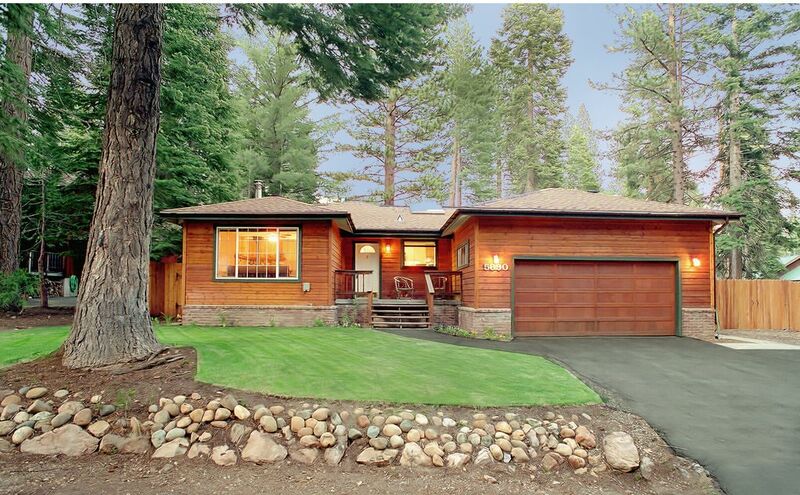 Centrally located on the North Shore between Tahoe City and King's Beach. It is only 20 minutes to Squaw and Alpine and 15 minutes to Northstar. Your family cooks will enjoy using the well stocked kitchen with stainless steel appliances and quartz counter tops. The oak Mission Style dining room set seats up to 10. and there is plenty of room for your group to spread out in this big one story house with a Living Room AND a Family Room. Each living room has a flat screen TV with DVD, and plenty of comfy seating. There is a 2 car garage and driveway room for up to 2 more cars. It is just a short walk to the dog-friendly town beach(Waterman's Landing),and also to the Sierra Marina and Gar Woods restaurant. Attend the Concours d'Elegance Wooden Boat Show in Summer. There are mountain biking and hiking trails right up the street,and we provide several bikes to use at the house. The North Shore Casinos are about a 20 minute drive, and you can walk to Gar Wood's Restaurant, miniature golf,or out for pizza. Old Brockway Golf Course is a three minute drive. Your whole family will have a great vacation and enjoy this pleasant and spacious one story Tahoe mountain home for fall, winter and summer vacations! Free Wireless Internet. 32' Flat Screen LED TV. Additional flat screen TV. 4 Full Bedrooms plus a Den/LR that can be closed off to effectively make a 5th private sleeping area. For Winter- Squaw Valley is 10 Minutes, Northstar and Homewood are just 15 -20 Minutes. #1) CA King Log Bed and a Twin. Master Bath with partially Hydronically heated tiled floor and luxurious tiled shower. Walk in closet. #5 A Queen Futon for extra sleeping flexibility in the Den/LR. The Living Room/Den has a folding room divider partition installed, allowing it to function as a 5th private bedroom if needed. Our daughter Madelyn is handling the rentals for our Carnelian Bay home now. our family has been renting our vacation rental homes in Tahoe since 2003. We often have our guests tell us that staying in one of our two homes is more like enjoying a friend's Tahoe Cabin than a rental house. I make it our policy to have a beautifully clean, nicely decorated Tahoe Style home for your mountain vacation, winter or summer. The Agate Bay neighborhood in Carnelian Bay is a peaceful, quiet area, and our lot is 1/3 acre. The large space between the homes gives our house a lot of privacy,made even more private by our fully fenced back yard. This house feels very spacious, with a living room and a separate family room in a different wing. It makes it very private for a big group. This property is SO peaceful with it's huge fenced in back yard, rock gardens and green lawns. The back patio is a perfect spot for summer barbeques. There are sunny and shady areas to choose from in the back yard. The neighborhood is a quiet residential area with all large lots for privacy. You can walk to the beach, Gar Woods, and several other restaurants. Bring your well behaved dog for a $20 per/nt. pet fee. Beautiful ceramic tile and stone in baths.The bathrooms have partially hydronically heated floors under the shower and tub. Hydronic Heating System. Very Comfortable! The living Room can be closed off to create a 5th private sleeping area. Plentiful Dishes, utensils, and serving platters and dishes. Quartz Countertops and Stainless Steel Appliances. Full cookware set and lots of dishes. Nice Assortment of Board Games. Adult and Children's. Summer Badminton net is set up. Also croquet set, bocce ball, basketball hoop in the driveway. Huge Landscaped back Yard and garden. 1/3 Acre Lot, fully fenced back yard. Newly Landscaped Private Fully Fenced Back Yard with a Badminton/Volleyball Net in the Summer. There is a New Sunken Patio with a Rock Wall Surround. There are two Dining Tables and a Hot Tub Under the Stars. Huge 6 Person Hot Springs Hot Tub Under the Stars in the Back Yard. Badminton/Volleyball net set up in the summer. 2 TV's including a 32'Flat Screen LED TV. This house fit our needs perfectly. We used it for a family gathering to celebrate my birthday as well as a Christmas present for our kids. The house is laid out nicely and was great for meals together, games, and still room to move around. The hot tub was nice after a day on the slopes and the kitchen is indeed very well stocked. I highly recommend this lovely home. As always, a wonderful stay! We've stayed at this property quite a few times over the years. It's evolved from a weekend getaway with friends to a weekend in the snow with the kids. This house is fantastic for groups with kids. There's board games, two living rooms, a hot tub, and a wonderful fireplace. The backyard is nice too and was the host of a big snow mountain adventure with my boys this year. The owner's are very responsive and thoughtfully left a basket with some wine and snacks on the table upon our arrival. The house is just a 15 minute drive to NorthStar, and a 5 minute drive to Tahoe Dave's great pizza, NorthLake massage (which is wonderful!! ), and Safeway. We'll be back! Thank you! We love to have return guests! Nice home with everything you need to enjoy a short or long stay in a perfect location close to great skiing and local restaurants. I highly recommend this property if you plan on visiting Lake Tahoe. Also, the owners are easy to work with and everything went extremely smooth. We look forward to coming back. The best place that we’ve ever stayed in Tahoe! We had a wonderful time, especially for our furry baby boy! We all love the house and the huge fences backyard. This is definitely the best place that we’ve ever stayed in Tahoe! Thank you so much for providing us such a lovely home and everything we needed for this amazing stay! We loved staying in this house! It was cozy yet spacious. We enjoyed having two living rooms! One was the "noisy" room and the other stayed relatively quiet. We had 8 adults and 2 children but there was still plenty of room. It was close to Northstar and also love the location at the north end of the lake. Perfect for us and we would definitely stay there again! Perfect home for large family vacation. Owners were attentive, professional.and helpful. This house is a wonderful vacation home and was a perfect pick for our Annual Family Vacation. Me, Chuck and our three grown children and their spouses found it spacious, comfortable, warm and filled with all the amenities. We enjoyed walking down to the lake and being close to ski runs, casinos, and fun bars. We flew into Reno, rented a truck and since we pre-ordered everything....we had groceries waiting for us at Sam's Club and Christmas gifts in Amazon lockers. The house was less than an hour drive away and had an easy access code for entry. We quickly unloaded groceries into the large refrigerator, moved into the cupboards set aside for guests and the home was at an ideal climate. Plenty of towels, laundry/dish detergent, and extra blankets for snuggling up on the couches. By the way, love front loading washer and driers..
Also, thanks for your attention to detail regarding instructions for everything about the house and the area. Your instruction book told us everything we needed to know. Thank you again, Maddie and Nate for sharing your lovely home with us. We had a VERY Merry Christmas and hope you have a wonderful New Year! Our popular 4 BR MILLER'S AT CARNELIAN BAY welcomes up to 10 guests with its four spacious bedrooms in a single story home style. There is plenty of 'public' space with a livThere is a CA King log bed in the masterbedroom, 2 more bedrooms with Queen beds, and the 4th bedroom has a twin captain's bed AND a set of bunk beds. The 6 person Hot Tub is located on the big patio area under the stars. The house is built on 1/3 acre lot and has a nicely lancscaped,fully fenced back yard for the kids and dog to play. For skiing, this home is located between Squaw Valley and Alpine & Northstar, close also to ski Diamond Peak and Mount Rose. .
$500 Refundable Security Deposit through Homeaway. Payment by check is preferred, but we do take Homeaway Pay. . Pet Fee $20/nt per dog for approved dogs.. Max of 3. NO CANCELLATIONS. If you must cancel I will do may best to re-rent your dates.Otherwise, no refund.